The only website that allows you to search for specialists that doctors recommend. Let us help you find the right specialist for your needs. What is ovarian cancer? What is the risk I'll get ovarian cancer? Ovarian cancer starts in the ovaries and often causes very minimal symptoms in the early stages. It is known to progress quickly and hence early detection is important. Lifetime risk of getting ovarian cancer for women is around 1 in 50 (2%). Family history of ovarian cancer in one first-degree relative would be associated with doubling of the risk (1 in 25, or 4%). BRCA 1&2 genes are associated with high risk of ovarian cancer (up to 50%). It was great to find a website that allows you to find specialists that doctors recommend. I saw a dermatologist I found through myHealthSpecialist.com and my skin problem has improved immensely. Thank you for making this possible. The fact the website is based on thousands of doctors recommendations means I trust the information being provided. Finding a trustworthy specialist is very important for me and my family. Getting cosmetic surgery isn’t something you talk to a lot of people about, so being able to search privately and see someone trusted by doctors gave me a lot of confidence to go ahead with my breast augmentation and I’m very happy with the results! I can’t believe this website didn’t exist already! 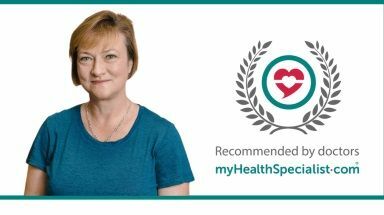 All the mums at school have been talking about myHealthSpecialist.com, so we used it to find an excellent paediatrician for our own children. It’s a great resource and I’ve told others about it too! I used myHealthSpecialist.com to find and request an appointment for a knee surgeon for my elderly mother. He explained the procedure very carefully and following a period of rehabilitation she is now able walk without pain. We are both happy to have found him. My family live abroad and use healthcare services in London. They have found this website very helpful for finding someone trustworthy, which is not always easy with so many services to choose from. Your session has paused after 30 minutes of inactivity.